The scene at Greenstar last night. 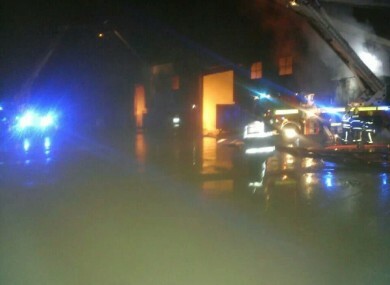 A FIRE AT a recycling plant in Cork last night is being investigated by gardaí and the fire service. The fire broke out at the Greenstar Recycling Plant at Sarsfield Court in Glanmire yesterday, with the Cork fire service receiving the call that alerted them to the blaze at about 8.50pm. A total of six units were first sent from Cork city fire service to the incident, with about 15 units in total ending up at the site. All the fire fighters remained there until about 3am, when the fire was brought under control. Some units of the county fire service are still in attendance, due to the risk of further fires breaking out in hotspots. Gardaí and the fire service are both investigating the cause of the fire, to determine whether it was started accidentally or maliciously. Email “Fire at Cork recycling plant under investigation”. Feedback on “Fire at Cork recycling plant under investigation”.